I'm going around the houses (pun) with acceptable materials, the planners like the idea of modern materials, however the house is quite conventional. 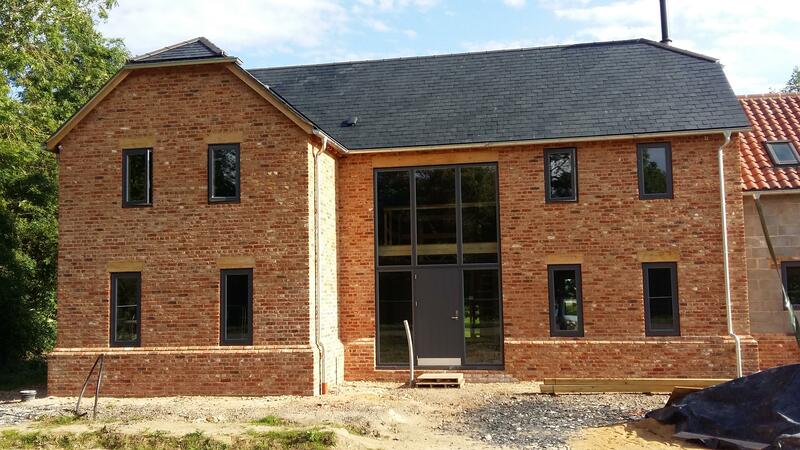 I think grey aluminium frame windows look excellent in a contemporary build, or with white render but I'm not inconvenienced it looks good with red brickwork. It's all personal choice. Some will like what you are proposing and others won't. As long as you like it that's all that matters. When your driving round the place take note of all the different colours of windows that are with red brick that you see and take a few photos. Will help you make your decision. Window colour is important in getting the look of your house right. Also the overall situation and design of he house should be considered. I love that soft green against brick...the right brick of course. A lot depends on the colour of your brick, I have seen the dark grey against some brick and it looks good also seen it against other brick and it looks b awful. I would not go for the light silver grey against any brick personally. A soft cream can look good too if the brick is not too harsh a colour. You can have modern materials in any colour it doesn't have to be Grey. Get a sample of your brick and some colour swatches of potential window colours as a start and put them together then when you find something you like go and drive around and try and find a similar look....google streetview via Rightmove can be very useful and save hours of driving.....Pinterest as well of course. I know Internorm showrooms have lots of colour samples on display (they do their Ali clads in pretty much any RAL colour not just grey) you could take your brick and try it next to some colours if you have a nearby showroom.......you dont have to buy internorm windows. Make yourself a scrap book with images of things you like. Online with Pintrest or old fashioned paper, cut and paste. Doing both of those things helped us feel less concerned about whether our opinion was right or wrong. Our neighbours have red brick cottages. One has white windows, the other soft green. Both look fine. +1 for @recoveringacademic. There's a big variation in 'red' bricks, and 'grey' windows, so look around and see what you like. Don't exclude the other elements of the build in the overall 'look' (rainwater goods, mortar colour, roofing materials). Below is Hoskins Old Farmhouse blend with Slate grey RAL 7015. It still needs the sills fitting, but you get the general idea. The colour chips are a reasonable size, so that gave us a good starting point to narrow it down to a smaller number of colours. The next step was to buy a small sheet of ply and then cut it up into approximately A4 sized chunks. Then off to our local Brewers decorator centre - they will mix paints to any RAL colour and can do small sample sized pots (Albany brand, I think) for a few ££ each - can’t remember exactly how much but it was less than a fiver each. We bought about half a dozen, undercoated the ply and then gave it a couple of coats of the RAL colours. I’m pleased to say they ended up looking almost exactly like the RAL K5 colour chips and the larger size helps you narrow it down even further. You won’t necessarily get the right sheen but the colour was certainly a good match. It worked for us and got us to an informed decision, I’m pleased to say. It worked well for us - so much so that we bought some Farrow and Ball sample pots and did exactly the same for our potential kitchen colours. Kitchen will be a custom painted one from DIY Kitchens. We decided to use the same shade of grey as the zinc coloured metalwork for the doors and windows as well. When the cedar cladding silvers I wanted to rename the house Shadezogray but it was vetoed.